Avaya IP Office 500 V2, 9.0.12.0 build 1006. If internal user A calls internal user B and user B has forward unconditional to a cell phone turned on, or mobile twinning enabled, the caller ID on user B's cell phone shows the 3-digit internal extension number of caller A. Which is arguably correct, but some of our users get confused by seeing a call from a 3-digit number. They think it's spam and don't pick up. Obviously better user education is an option, but aside from that, is there a way to make caller ID for these calls display a full 10-digit Canadian phone number, such as our main office phone number? Not sure if it's relevant, but "Send original calling party information for Mobile Twinning" is disabled. Thanks in advance. Guess we should assume you're using SIP trunks? Sorry for being a bit clueless, but I think... not SIP? In System Status my line type shows "T1PRI". Take a look at your outgoing ars. Here's how we've got it set currently. So your not sending out caller id. It should take the caller ID from ICR. Thank you, rdoubrava and janni78. So my understanding is that in the Telephone Number field, I would need to add an "s" and the number we would like displayed, hopefully that is correct? 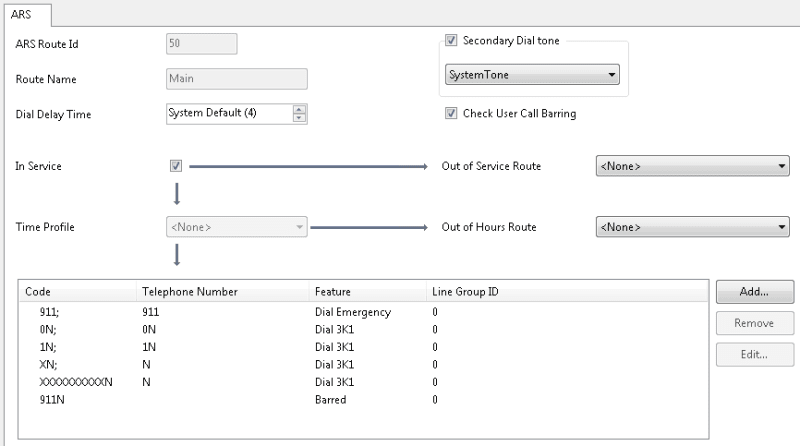 What I don't get, though, is that when we make an outbound call that doesn't involve forwarding/twinning, our standard main line is displayed on caller ID. That's what we want, but where is that coming from? janni78, you mention that it should take the caller ID from ICR, is that what you mean? Our main line is one of our incoming call routes, but I'm not sure how the system knows to use that particular route for caller ID. 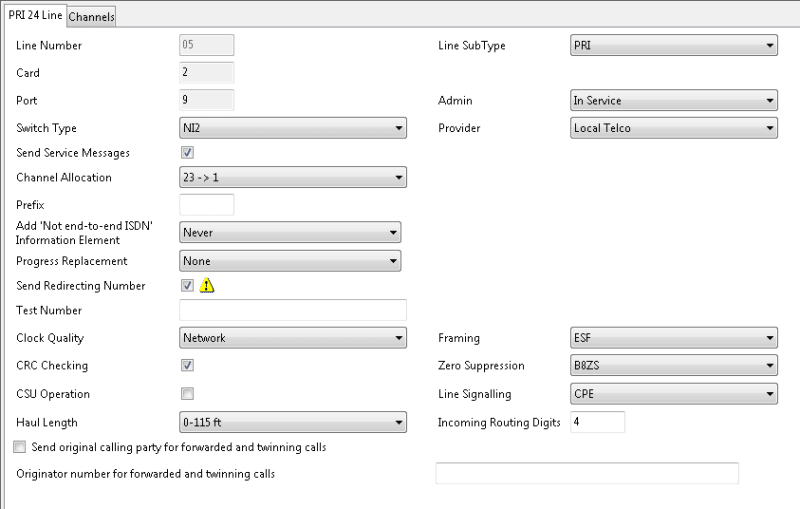 Multiple ARS tables with different short codes to access lets you decide on how you want the call sent. Dial 9+N for normal calls, dial 8+N for forwarding calls, etc. Thanks, TouchToneTommy, for that clear explanation. I tried adding S[our 10-digit number] to all codes except the 911 ones and saved config, however this did not seem to affect the outbound caller ID displayed for calls to extensions with forwarding or mobile twinning enabled. Caller ID on cell phone still showed the 3-digit extension of the internal caller. Not sure if I missed something? In the meantime I have asked our service provider to check into it, as they originally set this unit up for us. I will post back if they come up with a resolution. Have you tried enabling this? Hi Pepp77. I enabled it and calls sent out via mobile twinning now show our 10-digit phone number for caller ID, which is what we want. Thanks! However, we are still left with the caller ID issue when lines are forwarded. If anyone has any ideas, please let me know. We are still waiting to hear back from our service provider's tech support. Telco tech support ultimately had us uncheck "Send original calling party for forwarded and twinning calls" in PRI settings, while leaving "Send Redirecting Number" checked. Previously they were both checked. Three-digit extension no longer shows on caller ID for forwarded and mobile twinning calls. If an outside caller calls in and dials a forwarded extension, caller ID on the cell phone shows the outside caller's number. So all is good from our perspective. Here's a picture of our current PRI settings in case it's of use to someone in a similar situation. I wonder what that setting with the warning triangle is?